Stock photo of the statue of Jon Sigurdsson (1811-1879), Iceland's patriot, on the grounds of the Legislative Building in the City of Winnipeg, Manitoba, Canada. Jon Sigurdsson Statue on the Legislative Building grounds in the City of Winnipeg in Manitoba Canada. 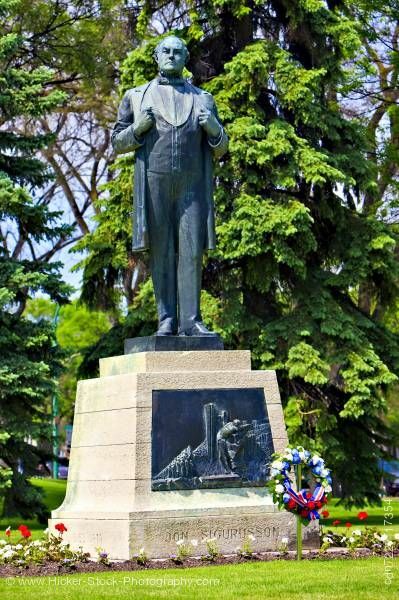 This stock photo includes the statue of Jon Sigurdsson (1811-1879), Iceland's patriot on the grounds of the Legislative Building in the City of Winnipeg, Manitoba, Canada. An advocate of Icelandic autonomy under Denmark, Sigurdsson took part in discussions that led to the Danish king Christian IX’s restoration of the old Icelandic Althing (parliament) as an advisory body in 1843. Sigurdsson was elected to that body for its first session in 1845, later becoming its speaker. Always pressing Denmark for self-government, he undoubtedly influenced the granting by Denmark in 1874 of a constitution that provided for Iceland’s control of its finances and for legislative power shared with the Danish crown.